Black Hills Gold Horseshoe Rings with Diamonds. From Landstrom's Black Hills Gold, the top name in Black Hills Gold. 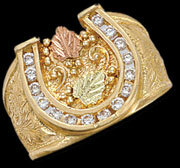 Both Ladies and Mens rings includes 16 diamonds. 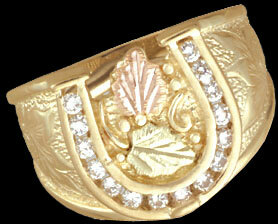 Ladies horseshoe ring is 0.30 carats total weight and the men's ring is 0.45 carats.